Disclosure: This is a compensated post in collaboration with Gourmet Garden US Herbs. As usual all opinions are my own. Thank you for supporting the brands that support NJB! This is such a Summer meal, it couldn’t be more Summer! 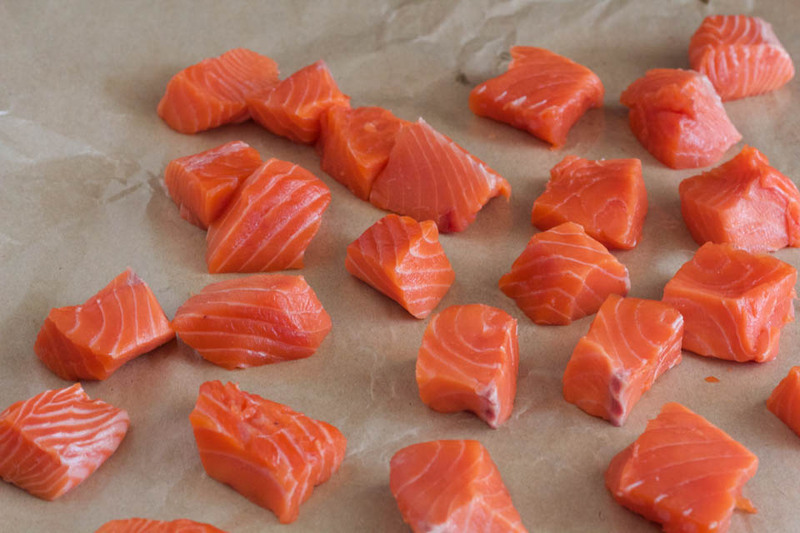 Salmon is in super season right now, from King Salmon to Copper River. Making these Thai Salmon Skewers in under twenty minutes makes it an even better dish to cook for this weather. Getting outside to grill in our new to us backyard has been so nice. Settling into easy, normal day to day things has taken a while. I think we’ve been here one month, and there is still so much unpacking that needs to be done. So for me, grilling and sitting outside enjoying this meal has made relaxing actually possible. When there are boxes to unpack, laundry to wash, floors to clean the last thing I want to do is make dinner in the Summer a chore. That is what Summer cooking is all about. Grilling, enjoying the yard, some cold beverages and easy peasy Salmon dinners. You know that is exactly why I love Gourmet Garden products, they make my life so much easier. I marinated the fish in the Thai Seasoning, and some lime for a few minutes, and then grilled them up. This may be the best salmon I’ve ever made. It for sure starts with the fact that I bought in season fresh salmon from a good source. Then the marinade, oh my gosh, so good. The fresh in season salmon pairs perfectly with the Thai seasoning herb blend that has cilantro, lemongrass, and red pepper flakes to make a super easy and flavorful dinner. Salmon tips! It’s King and Copper River Salmon season, either would work. Find fillets or center cuts that are a bit thicker to make it easier to cut into 1 inch cubes. I bought a large fillet that I deboned and skinned myself. You can totally do that, but depending on where you buy your fish, they will debone, skin, and cut the fillet to whatever you want. Just ask! Grilling and cooking fish tips! Basically, fish lets you know when it is ready to be turned. If you go to turn the fish and it sticks, its not ready. When fish is ready to be turned, it lifts from the surface very easily. If you have any questions about this, please ask in the comments below! 1. 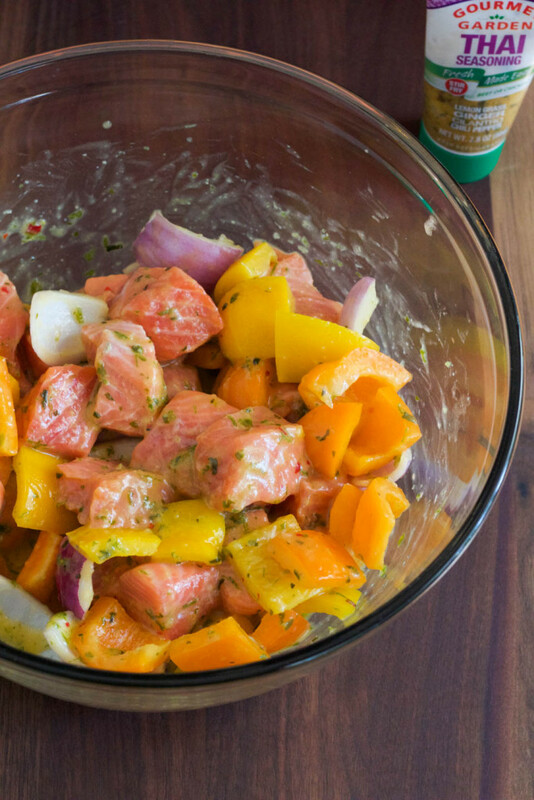 Place cubed salmon, peppers, and onion in a large bowl with olive oil,thai seasoning, lime zest, juice, and salt. Gently mix together to coat salmon and vegetables using your hands or spoon. Marinate for minimum 10 minutes and up to 20. Place bamboo skewers submerged in water in a bowl, this will prevent them from lighting on fire on the grill. Get grill ready. Heat one side of grill to medium high heat to get a good sear on the fish. If the grill grates are not hot enough the fish will stick. 2. Start assembling skewers by placing a vegetable on first to keep fish on stick. Then alternate as you want! Just start and finish each skewer with a vegetable. Mine were like this…pepper, salmon, pepper, onion, salmon, pepper, onion, pepper, salmon, pepper. 3. 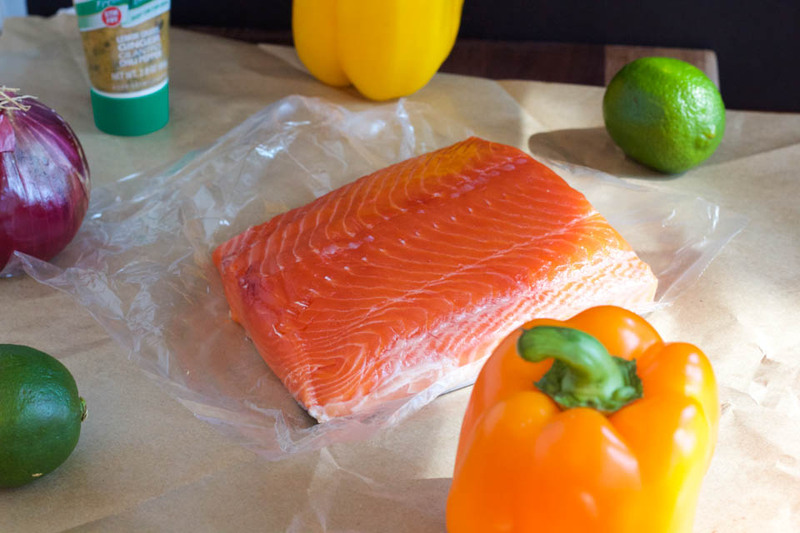 Using a rag or paper towel with a splash of olive oil, rub on the grates of the grill where you will be cooking the salmon. The total time for the skewer with 1 inch salmon cubes is about 12 minutes. Place skewers on grill and cook for about 4 minutes on each side and once on its side for 4 minutes. This will give a medium cooked salmon. Other Gourmet Garden recipes on NJB! Gourmet Garden recipes from blogging friends! 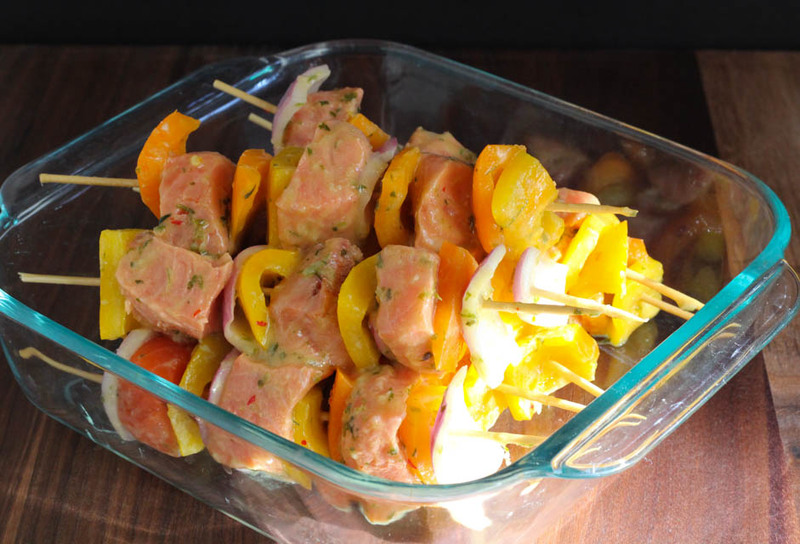 Love these skewers, such a great idea for salmon. Love Gourmet Garden for adding tons of flavor, without much work! These are just gorgeous! I forget ow easy and delicious fish is on the BBQ! Yep I can totally seem myself grilling this. I like the idea of big salmon chunks for skewers. I did a salmon kabob recipe but cut thinner strips and skewered them accordion style. Will have to try this method. I find that the bigger pieces don’t overcook, and it stays tender and juicy! Thank you, I hope you like the method. I love Thai flavors and these look perfect! Great use for salmon too. The color of that salmon incredible! These skewers look fresh and love the GG Thai herbs. What stunning colors and flavors! 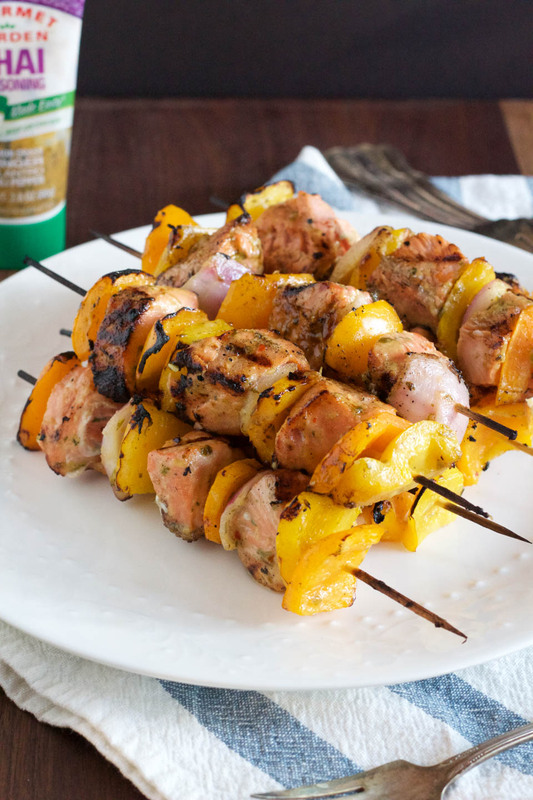 These skewers are perfect for an evening at the grill. Thank you, Steph! It really is, it takes so little time, super filling, and healthy! These look mighty tasty. Love skewers in the summer; they’re so versatile. That screams summer grilling! I bet this is fantastic with the Copper River Salmon! I just love that Copper River Salmon! Thank you. What a great idea! I’ve never barbecued salmon before, let alone thought to make skewers with them. Love it! Totally try it!!! Thank you. These skewers look so delicious. What a perfect summer dish! I love Gourmet Garden products but I haven’t seen the Thai Seasoning – I’ll be looking for it now! Me too, makes quick meals fresh and easy! I hope you find it, it’s so good. Perfect timing, I’ve been looking for a great salmon skewer recipe! Huge fan of Gourmet Gardens, and now these Thai Salmon Skewers! YUM! Me too! It makes life easy breezy for sure. Thank you! These skewers are so pretty! I love how healthy they are too! I’m going to be on the lookout for Gourmet Gardens Thai Seasoning too! Thank you, Kimberly! I so needed a healthy easy meal for outdoor cooking, so these were born from that! I have a serious salmon addiction and buy king salmon or copper river at least twice a week. This recipe is getting added to the rotation, LOVE all the Thai flavor in here! Wow that is addiction! But I don’t blame you, it’s so good. Especially right now. Thank you! I use that Thai paste, and love it! 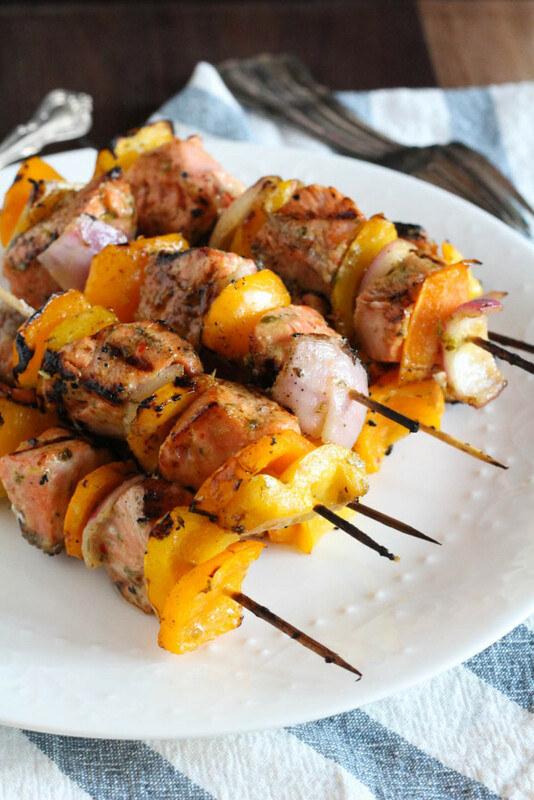 Your kebabs look like summer on a stick to me! Isn’t it awesome?!! Again with the ease if things, it’s been great. Stick food is so Summer! I hope you are well :). That salmon looks so fresh and delicious. I’ve heard of the Gourmet Garden products, but I don’t think I’ve seen the Thai flavor. I’ll have to look for it. Thank you, Christine! I hope you find it, it is so good! I could see this being on my kitchen table most days this summer. Looks wonderful!